The maximum temperature on Tuesday was 34.8ºC and the minimum 25.4ºC. The maximum relative humidity was 92 per cent and the minimum 62 per cent. Rainfall: Rain or thundershowers have occurred at most places in east Rajasthan, at many places in west Uttar Pradesh and Uttaranchal, at a few places in Haryana and east Uttar Pradesh and at isolated places in the rest of the region. The chief amounts of rainfall in mms are: Haryana: Ayanagar, Delhi Ridge, Guhla, Jind, and Karnal 1 each, Himachal Pradesh: Bangana and Kangra 1 each, Punjab: Ludhiana 2, East Rajasthan: Nadbai 13, Galwa 10, Chandsen, Hindoli and Tonk 9 each, Deeg 6, Halena and Sikrai 5 each, Begu, Bundi, Behrot, Hingota and Galwania 4 each, Busawar, Indergarh, Jhalawar, Jaipur, Kumher, Nagar, Sangod, Sawai Madhopur and Uchain 3 each, Byana, Chaksu, Chikali, Sarwar and Veir 2 each and Taleda 1, East Uttar Pradesh: Ballia 6, Chandradeepghat, Mirzapur, Rae Bareilly and Varanasi 5 each, Turtipar 3, Katerniaghat and Neemsar 2 each and Balrampur, Elginbridge, Fatehgarh, Ghazipur, Jaunpur, Mukhlishpur and Shardanagar 1 each, West Uttar Pradesh: Agra 5 and Bareilly 1 and Uttaranchal: Haripur, Hardwar and Mukteshwar 4 each, Marora 3 and Dehra Dun and Tehri 1 each. 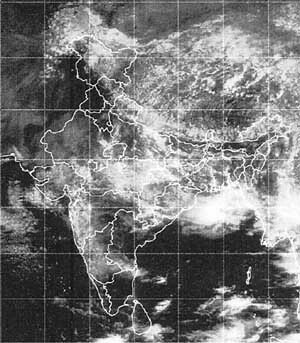 Forecast valid until the morning of August 14: Rain or thundershowers will occur at many places in Himachal Pradesh, east Rajasthan, east Uttar Pradesh and Uttaranchal, at a few places in Haryana, Jammu and Kashmir, Punjab and west Uttar Pradesh and at isolated places in west Rajasthan. Heavy rainfall warning: Isolated heavy rain is likely in Himachal Pradesh, east Rajasthan, east Uttar Pradesh and Uttaranchal during the next 48 hours. Forecast for Delhi and neighbourhood valid until the morning of August 14: Mainly cloudy sky with one or two spells of rain or thundershowers in some areas. Farmers weather bulletin for Delhi forecast valid until the morning of August 14: Light to moderate rain will occur at a few places.